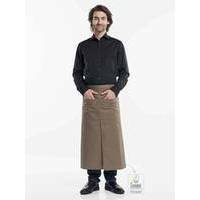 The Chaud Devant Apron 4-Pockets is the user-friendly apron for serving staff. Serving staff�s equipment can be perfectly distributed between the four pockets. They are ergonomically positioned and are highly practical. The central split offers ultimate freedom of movement and also gives the apron a trendy look. The Chaud Devant Apron is available in four models: Black, Grey, Taupe and Black Denim.